It's all coming full circle for this royal family. They say history repeats itself. Exhibit A: Prince Harry and Meghan Markle's latest appearance. 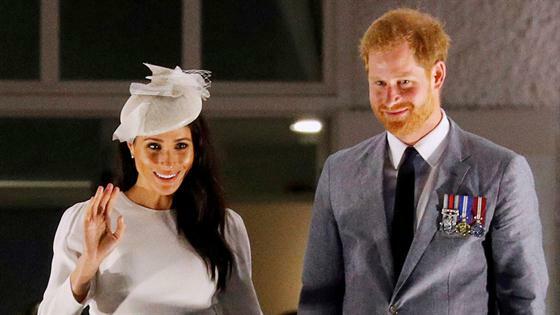 As the expectant couple continues their first joint royal tour, the pair stepped out on Monday in Fiji from the balcony of the Grand Pacific Hotel in Suva, a familiar setting for royal enthusiasts. It was on that very balcony in December 1953 that the father-to-be's famous grandmother, Queen Elizabeth II, waved to crowds alongside husband Prince Philip. At the time, the couple was attending a ball held in the monarch's honor during her coronation tour, which lasted into 1954. In a similar fashion, the Duke and Duchess of Sussex returned to the same spot more than 60 years later during their first joint royal tour as newlyweds and on their first day in Fiji. Much like the queen all those years ago, Meghan and Harry looked every bit the elegant royals as the pregnant star sported a white, long-sleeved Zimmermann dress and matching fascinator by Stephen Jones while her British beau opted for a slate suit adorned with medals. Thousands of locals were eager to see the pair as crowds collected below the balcony. It seems Harry's history continues to follow him, particularly on the heels of a resurfaced magazine cover of his grandfather, with whom he shared a striking resemblance. While attending a state dinner hosted by president Jioji Konrote at the hotel, he acknowledged the historic location during his speech. "This visit is particularly nostalgic for us as a young married couple—my grandparents stayed in this very hotel, the Grand Pacific, a number of times over the years," Harry noted. "But this visit is also an opportunity to learn more about the future of Fiji, your economic growth, sustainable tourism development and social enterprises. We are really looking forward to meeting the students at the University of the South Pacific and the young leaders from all walks of life. The health and sustainability of this planet depends on the younger generation, and they are full of optimism so let's listen to them."